Punahou's Dalton Hilliard elevated over Corey Lum of Saint Louis during the second half last night. Punahou found a diamond in the rough, pun intended, in a heated battle with Saint Louis. The second-ranked Buffanblu turned on the defensive pressure at the start and never backed down in a 59-53 win over No. 6 Saint Louis before a robust crowd of about 1,200 at Hemmeter Fieldhouse. Kameron Steinhoff scored 17 points and Dalton Hilliard added 12, plus five of his team's 12 steals. Center Trevor Crabb added eight points and three blocks as Punahou improved to 5-1 in the Interscholastic League of Honolulu. Hilliard was the most successful thief in a "diamond" zone trap that eventually wore down the visitors. "He let us go. He let us play and trusted us," Hilliard said of coach Dan Hale. "We ran our offense and stayed within our gameplan. We didn't let them bully us around like they did in the first game. We brought the pressure." 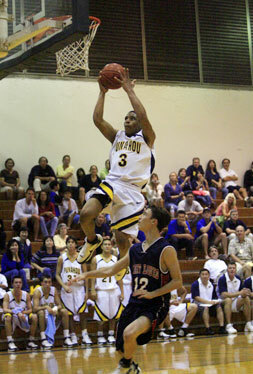 The first time, back on Jan. 10, Saint Louis let a 22-point lead slip away in Punahou's 55-52 win. This time, Punahou shot nearly 50 percent from the field (19-for-40) and never trailed, though the Crusaders hung tough with solid free-throw shooting and superior rebounding (29-24). Punahou's extended full-court and half-court traps were a nuisance for Micah McClinton. The 6-foot-3 sharpshooter had 18 points in the first matchup, but finished with just nine last night. "They kept their eye out for me. I couldn't get good looks. It's hard to shoot over 6-6 guys," McClinton said. Cole Shidaki led Saint Louis (3-3) with 14 points and seven rebounds. Reserve guard Dean Viena added 12 points. The Crusaders were 14-for-19 from the foul line, but committed 13 of their 22 turnovers in the second half as the game slipped away. A 3-pointer by McClinton pulled Saint Louis to within 33-32 early in the third quarter, but Punahou's defense stifled the Crusaders. Reserve forward Kimo Makaula's hustle for a three-point play on a putback gave Punahou a 44-35 lead late in the third quarter. Saint Louis got no closer than five the rest of the way as Punahou hit its foul shots at the end. The Buffanblu were 8-for-17 from the line in the first three quarters, but hit 11-for-17 in the fourth. Hilliard was 4-for-6 at the line in the final quarter. "When you go uptempo, you need to take extra time out there at the line," Hale said. "Our guys did a great job. It's always physical against Saint Louis, and they got their baskets in transition. But it helps us to get our guys running and trapping and pressing." Punahou's gauntlet next week includes Iolani, Kamehameha and Mid-Pacific. Steinhoff, remembering Punahou's loss at Iolani two weeks ago, is ready. "Iolani, here we come," he said. SAINT LOUIS -- Lucas Gonsalves 2, Micah McClinton 9, Corey Lum 0, Dean Viena 12, Kyle Gonzaga 0, Cole Shidaki 14, Marcus Umu 2, Michael Tuiloma 7, Jamison Miller 5, Moses Sania 2. PUNAHOU -- Dalton Hilliard 12, Robbie Toma 5, Matt Feldman 0, Sean McFadden 2, Shane Yoshiyama 0, Henry Cassiday 3, Kimo Makaula 6, Manti Te'o 6, Kameron Steinhoff 17, Trevor Crabb 8, Casey Shibuya 0. 3-point goals -- Saint Louis 3 (McClinton, Viena, Shidaki), Punahou 2 (Hilliard, Toma). Richard Herring's 17 points led the Spartans past the Monarchs. MARYKNOLL -- Kent Kawahara 0, Brian Saxton 2, Tyler Terai 0, Scott Kamimura 7, Garrick Chock 9, Christian Bueno-Kanei 4, Javen Correia 6, Dillon Keoney 1, Shelby Nakakura 1, Rian Huizingh 0, Micah Kalepa 4, Richard Herring 17, Jordan Napoleon 0, Ross Lum 11. DAMIEN -- Nikko Romuar 7, Drey Dutro 5, Tim Smith 5, Anthony Tuitele 2, Kaiakoili Lima 11, Nick Cerny 4, Aminis Thompson 10, Austin Dawson 2, Michael Memea 0. 3-point goals -- Maryknoll 2 (Kamimura, Chock), Damien none. The Eagles' defense held the Warriors to under double digits in three quarters for the win as P.J. Mianaya scored 18 to lead Hanalani. LANAKILA BAPTIST -- Z. Ramos 0, M. Takahashi 0, J. Pananganan 4, A. Cayabyab 2, M. Miranda 0, K. Ochman 3, C. Hazlewood 13, C. Oasay 11, G. Yiri 2. HANALANI -- Andrew Kutaka 0, Darin Kamealoha 15, P.J. Minaya 18, Matt Simbre 2, Matt Guerrero 2, Brysen Honda 2, Andrew Rattanasamay 0, Tyler Simao 8, Josh Thomas 1, Jon Cunningham 3. 3-point goals -- Lanakila Baptist 1 (Hazlewood), Hanalani 5 (Kamealoha 3, Minaya 2). Kahu Mariani scored 10 points and Gabe Miller added eight to lead the Firebrands past the Lions. WORD OF LIFE -- Rafy Torres 0, Ryan Alvarado 0, Kyle Higa 0, Daniel Zerba 6, Jared Shimabukuro 6, Roc Ornog 2, Jacob DeKneef 5, Peter Hanakahi 0, Aaron Tipoti 4, Gabe Miller 8, Christian Siliva 0, Phillip Clarke 6, Kahu Mariani 10, Travis Ogami 7. LUTHERAN -- Joshua Perry-Kruse 0, Ronald Nipp 6, Michael Abang 17, Kyton Keliiaa 2, David Cho 2, Ryson Gander 2, Bronson Hagihara 0, Matthew Nishiyama 0. 3-point goals -- Word of Life none, Lutheran 4 (Nipp 2, Abang 2). Bradley Foster scored a game-high 37 points as the Dolphins beat the Admirals for their first win in divisional play. ACADEMY OF THE PACIFC--Jordan Ching 0, Evan Paresa 0, Bradley Foster 37, Ikaika Ramos 4, Lopaka Davis 0, Nick Seaburg 2, Daniel Stanfield 4. ASSETS--Grant Kitagawa 4, Kupu Henderson 3, Brandon Kushima 8, Rance Kuwata 13, Garrett Kato 0, Logann Molina 4, Fabrrizio Alliata 0, Cory Kacher 0, George Cambra 7, Jordan Kumasaka 0. 3-point goals -- Academy of the Pacific none, Assets 5 (Kuwata 3, Kushima 2). Tana Woodard scored 17 points and Tavita Woodard aadded 16 as the Tigers dominated the Rainbow Warriors. ANUENUE -- Ikaika Gante 2, Kekoa Sitarek 3, Kelii Kon 11, Aina Kelii-Supnet 9, Makamai Otani-Wengler 2, Kaiponohea Preston 4, Kamaki Sherman 7, Kanani Armitage 0, Cullen Lopaka 0. MCKINLEY -- Julius Borje 2, Kaleo Ponce 4, J.T. Thabiti 4, Moku Spencer 9, Earvin Sione 14, Tavita Woodard 16, Marshall Miyasaka 0, Tana Woodard 17, Tae Lee 7. 3-point goals -- Anuenue 5 (Kon 3, Sitarek, Sherman), McKinley 1 (Lee).